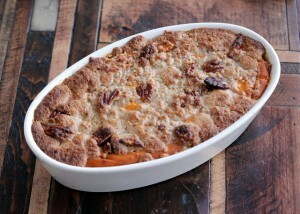 The holidays wouldn't be complete with sweet potato casserole. Our low carb, gluten free version lets you enjoy this holiday favorite! Place cauliflower florets in a steamer basket over boiling water, cover and steam until very tender, 12 to 15 minutes. Place the cooked cauliflower in a food processor and blend until very smooth. In a mixing bowl, combine the cauliflower, pumpkin, sweetener, eggs, almond milk, salt, ⅓ cup butter and vanilla. Mix together and pour into a greased 13x9 inch baking dish. To prepare the topping: combine the sweetener, almond flour, ⅓ cup melted butter and pecans. 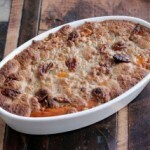 Mix together and crumble over "sweet potato" mixture. Bake uncovered at 350 degrees F for 35 to 45 minutes.